Members of Wilmington Kiwanis and the Aktion Club teamed up, with the Aktion Club making activity kits as well as sorting books. 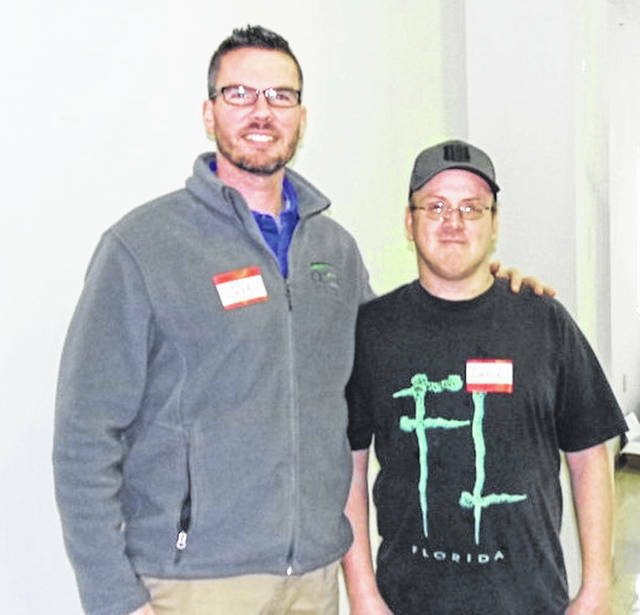 Aktion Club advisor Josh Adkins and member David Burton. WIMINGTON — The Kiwanis Club of Wilmington and their sponsored Aktion Club of Wilmington recently met for service, fun and fellowship. The service project involved making activity kits for children visiting Health Source. Members also sorted books for the Literacy Project at Faith Lutheran Church and made bookmarks to be included. Immediately following lunch, the 2019 Aktion Club members were recognized and received a Kiwanis backpack as a token of thanks as they represent the “K” family in the community. It was especially an honor for the club to have Ohio District Governor Faith Levine in attendance. She had gracious comments to share about the club and the Aktion Club. She further explained the First Family Project of “Kamperships” for 4-Hers. The Kiwanis club has already donated $100 to this cause and that money will come back to Clinton County to help fund a 4-Her to go to camp. Div. 4 Lt. Gov. Marcia Hudson from Springfield was also able to join us for the day. Aktion Club advisor Josh Adkins and member David Burton shared some of this year’s activities, which include recognizing veterans at several local nursing homes, decorating the Christmas tree in the Municipal Building, and the upcoming stuffing of Easter eggs for the public library.